EfficientPIM is a personal and product information management platform intended to help users keep track of contacts, appointments, passwords, tasks, notes, and more. The software has been updated to Efficcess, which works in both desktop and mobile devices. Tools to stay organized and efficient are all accessible in an all-in-one and easy-to-use interface. One can quickly synchronize information across PCs and handheld devices, thus making needed information readily available anytime and anywhere. Search properties are also extensive, allowing convenient data retrieval. Files can be imported or exported to programs such as Word, Excel or Notepad, and can also be printed directly. EfficientPIM has a Document Editor for writing notes, diary, and memo entries. A Recycle Bin feature helps retrieve deleted information that may still be needed. There are also Backup and Restore options, with all information stored in encrypted format. EfficientPIM has solutions for both personal and product information management, for individuals and businesses respectively. For personal use, EfficientPIM has an Address Book that can safekeep information of thousands of contacts. A sleek Task Manager assists in getting work accomplished on time, without compromising output quality. Extensive Reminder and Calendar functionalities help keep track of appointments, holidays, and events in order to stay on top of schedules. A Diary Pro creates beautiful yet functional diary entries, with easy editing capabilities similar to what Microsoft Word offers. EfficientPIM has a full-text search technique for its Notes feature, which means one can quickly locate a note even by inputting just a single keyword. Sticky Notes keep track of random information without having to rely on traditional paper posts that tend to create clutter. An efficient Password Manager Pro helps users remember generic passwords, software registration codes, e-mail account passwords, and more. For businesses, EfficientPIM has a powerful Address Book Network for managing valuable client information. By recognizing the importance of each contact, business efforts can be executed more properly. A To-Do List Network allows team members to share tasks and track progress, thus boosting productivity, while a Reminder Network provides a professional and reliable way of setting up meetings and schedules. A Calendar Network merges schedule reminders and tasks together, in order to share data in a more organized manner and enhance work efficiency. Diary software allows users to insert tables, pictures, emotion icons, attachments and more. Notes features help save time and upgrade work efficiency. Lastly, a Password Manager Network ensures that an entire team accesses the same official data, such as passwords for website, email accounts, FTP accounts and registration codes. 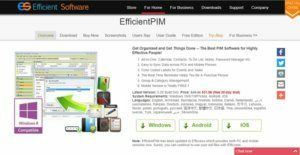 If you are considering EfficientPIM it might also be beneficial to examine other subcategories of Best Product Information Management - PIM gathered in our database of SaaS software reviews. It's essential to note that hardly any service in the Product Information Management - PIM category is going to be an ideal solution able to match all the requirements of different company types, sizes and industries. It may be a good idea to read a few EfficientPIM reviews first as specific services can perform well exclusively in a very small set of applications or be designed with a very specific industry in mind. Others can work with a goal of being easy and intuitive and as a result lack complicated features welcomed by more experienced users. You can also find services that focus on a large group of customers and offer a complex feature set, however that usually comes at a more significant cost of such a service. Make sure you're aware of your needs so that you choose a software that provides specifically the elements you search for. How Much Does EfficientPIM Cost? We realize that when you make a decision to buy Product Information Management - PIM it’s important not only to see how experts evaluate it in their reviews, but also to find out if the real people and companies that buy it are actually satisfied with the product. That’s why we’ve created our behavior-based Customer Satisfaction Algorithm™ that gathers customer reviews, comments and EfficientPIM reviews across a wide range of social media sites. The data is then presented in an easy to digest form showing how many people had positive and negative experience with EfficientPIM. With that information at hand you should be equipped to make an informed buying decision that you won’t regret. What are EfficientPIM pricing details? What integrations are available for EfficientPIM? If you need more information about EfficientPIM or you simply have a question let us know what you need and we’ll forward your request directly to the vendor.